A few years back, this paper did an extended investigation of increasing CEO compensation, and found that while “abuses and downright crookery” were part of the story, CEO pay gains were justified by increased returns to investors. That, however, was in 2007, before the global financial crisis erased many of those gains. returns their companies enjoyed were largely illusory. That’s now a lot more obvious than it was five years ago, but there’s nonetheless been no movement to reduce executive/financial pay in response. Still, not all of those increasing returns were illusory. A lot of it was perfectly real. More broadly, then, the question is this: if returns are increasing everywhere, do CEOs as a class deserve ever increasing pay packets? Why? If a single company does significantly better than its competitors, that’s a sign that its executive team is doing something right. But if the global economy as a whole is booming, and most companies are just riding the wave, that’s a sign of absolutely nothing. CEOs as a class aren’t responsible for global economic conditions, and individual CEOs deserve no special consideration for merely benefitting from a growing economy. This, to me, has always been the smoking gun in conversations about executive pay. If corporate executives are really being paid for performance, they should be paid richly if their performance is significantly better than the competition and less if their performance is worse. They shouldn’t be paid richly if their performance merely matches the overall growth rate of their industry or the economy as a whole. For the most part, though, that’s exactly how they’ve been paid ever since the early 80s. 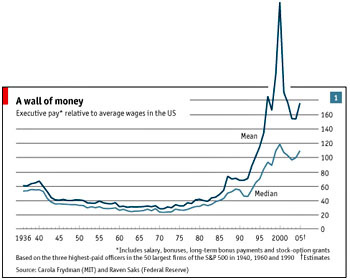 Merely average performance drives outlandish pay increases, and the penalty for poor performance is almost nonexistent. Corporate executives, as a group, are wildly risk averse, and over the past few decades have mostly been paid simply for going along for the ride when the economy is doing well. As soon as that changes, I’l be open to arguments about CEOs deserving their astronomical pay packets. But there’s no sign of it yet.